David Ward was born in England in 1960. Childhood holidays in the Lake District and Cornwall led to a love of landscape and a desire to try and express his sense of wonder through art. He became fascinated by photography in his late teens and was accepted for the prestigious Film & Photographic Arts course at PCL in London, where he was a student of Victor Burgin. David graduated with a BA Hons in 1983. He has now spent thirty years travelling the world with his large format camera. His eye for colour and form is without equal and he produces work that is startling in both its clarity and intensity. As well as numerous articles, David has written two critically acclaimed books on his craft; Landscape Within (2004) & Landscape Beyond (2008). In these, through a series of essays, he explores the medium’s history and looks at deeper philosophical questions about art and photography. He is fascinated by the gap between vision and photography and seeks to explore this through his work. Our understanding of colour is on the one hand instinctive and innate. We know what looks 'good' when we see it but most of us know very little about why we see colour the way we do and the ways in which artists can leverage that knowledge in understanding their photography. David Ward has a quiet obsession about the ways in which we see and articulate colour ideas and discussed some of the more interesting and useful facts about the chromatic world. Following the talk, we interviewed David Ward in our Green Room. Making photographs of the landscape is often, necessarily, a solitary pursuit. But that doesn’t mean we want to be hermits. What we want is the company of like-minded people. We want a place to view the photographs of others and, perhaps, somewhere to show our own work. We also want a place to find new ideas – both aesthetic and technical. 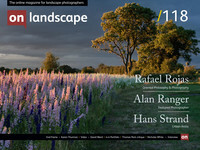 On Landscape provides the ‘virtual’ place where all of those things can happen, a place where the disparate community of landscape photographers can meet and exchange ideas. It’s the perfect environment in which to share our passion. But wonderful as the online magazine is you can’t beat meeting people face-to-face.